Darwin hire equipment firm, Top End Access, takes delivery of a Genie SX-180, an astounding, self-propelled boom lift capable of telescoping to an unprecedented 186 ft working height. 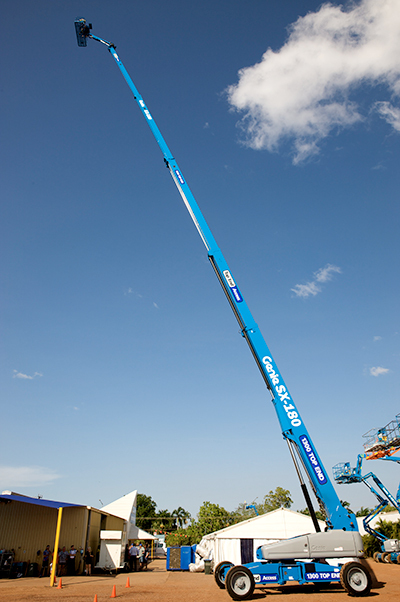 This is the first Genie® SX-180 boom to be ordered by and delivered to an Australian company. The Northern Territory Attorney-General, the Hon Minister John Elferink MLA, officially launched the Genie SX-180 boom lift at Top End Access in Darwin on Friday 21st November. Darwin (December 8, 2014) Leading Darwin hire equipment firm Top End Access has taken delivery of, launched and made available for hire, the revolutionary Genie SX-180, an astounding, self-propelled boom lift capable of telescoping to an unprecedented 186 ft working height. Made in the US, this is the first Genie SX-180 boom lift to be ordered by, and delivered to an Australian company. At the 21st November Darwin launch at Top End Access, the Hon Minister John Elferink MLA, Northern Territory Attorney-General, unveiled a plaque commemorating the arrival, and commissioning, of this astonishing piece of equipment. The Genie SX-180 is the highest reaching boom lift made by the Seattle-based Terex Aerial Work Platform. It has been under development for a number of years, and in mid-2014 became a reality. Top End Access placed an order for one in early 2013, and is delighted that it has now been delivered. Terex Aerial Work Platform Sales Manager Michael Scott said, “This is a landmark moment for Genie in Australia, for Top End Access and for the Australian equipment hire industry in general. Now, users will be able to go higher than ever before using a self-propelled boom lift. “The Genie SX-180 boom lift is ideally suited for a huge range of industries – construction, maintenance, telecommunications, gas and oil refineries and large utilities. It also has a wide working envelope giving it unique versatility. “We have been anxiously awaiting the arrival of this Genie SX-180 boom lift, and we are immensely proud and excited that it is finally here. We also think Darwin is an ideal location for the SX-180 boom lift - there are multiple opportunities there for its unprecedented capabilities”, Scott said. Top End Access’s General Manager, Geoff Guy said, “Taking delivery of the SX-180 boom lift shows the faith the directors have in their company and in the Northern Territory in general. They believe the Northern Territory is continuing to grow and develop, and they want to make sure they’re at the forefront of having the right access equipment available to meet the needs of the customer. “The Genie SX-180 boom lift fits in perfectly with Top End Access’s motto of ‘Get Higher, Safer, Sooner’. With its unique features, it will enable users to do just that. And to get some idea of how high it can go, its reach is around the same height as Northern Territory House. “We expect the SX-180 boom lift to be utilised quite vigorously by local mining and construction operations, but its use is not limited to just those two sectors. Our SX-180 boom lift is now ready for hire, and we anticipate interest from many areas – where getting safe access to great heights is required”, Guy said.